Subterranean termites are the most common type of termite found in the United States. Subterranean termites cause billions of dollars in structural damage each year. Some colonies have more than one female that lays eggs so a Subterranean Termite colony may have as many as 1,000,000 termites. As the name suggests, Subterranean Termites live in the soil and enter your home through earth to wood contact, cracks in the foundation and concrete walls, or by building mud tubes that reach up to the wood of the structure. Termites can forage through the soil hundreds of feet from the site of their nest. Subterranean termites use their mud tubes for shelter, climate control, and protection from the environment and from predators. Infestations are often found near plumbing, water heaters, floor heaters, wall heaters, or fireplaces because Subterranean Termites are attracted by moisture leaks and heat. If a Subterranean Termite infestation is located on your property, we recommend application of Termidor (fipronil). The social behavior of termites spreads the Termidor and leads to total colony control within a matter of weeks. If subterranean termites are found in the sub area of a home, we typically trench and treat the soil and pier posts around your home with Termidor (fipronil). 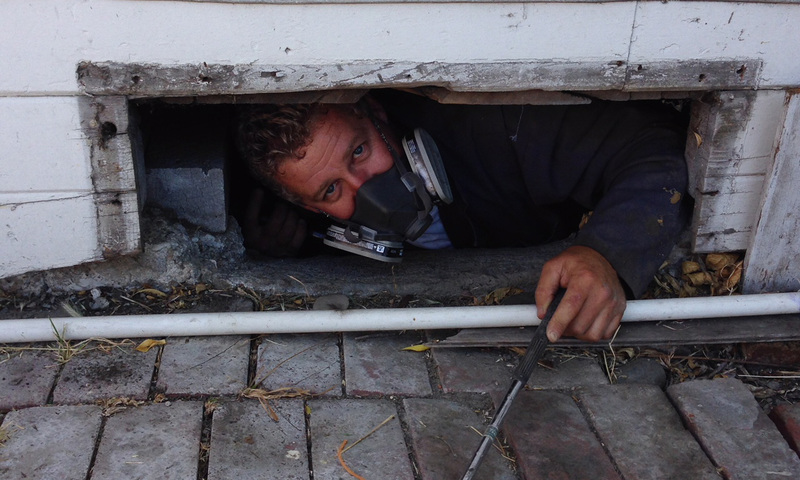 If your home is built on a concrete slab and Subterranean termites are identified coming up through a crack in the slab, we drill holes into the slab around the site where the termites are entering the home. We then use the holes in the slab to inject Termidor (fipronil) into the soil beneath the slab. After the treatment, we fill the holes in the slab with cement. In some cases, sleeper floors are built for garages or rooms that have been converted by building up the floor to match the floor level of the rest of the home. With sleeper floors is it often necessary cut a hole in the floor or remove several floor boards to allow access to drill holes in the slab and treat the soil beneath the slab. Outside the home, it is sometimes necessary to drill into concrete patios, entry pads, and walkways to treat the soil beneath the concrete. In fact, earth filled concrete porches are a common area where Subterranean termites find cracks or gaps in the concrete to access the wood structure of the home. A great way to stop Subterranean Termites before they infest a structure is to treat pre-construction sites. For pre-construction soil treatments, the soil is saturated with termiticide just prior to pouring the cement for the slab or foundation. At Mojoe Termite, we offer a six-year guarantee for our Subterranean Termite treatments because our approach to these treatment have proven to be highly effective at eradicating all the termites from the structure.